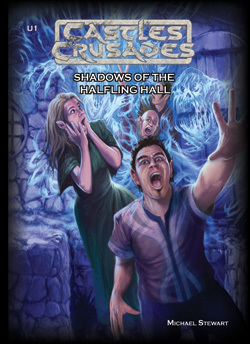 A dreadful fear and terror-born nightmare lingers in the shadows of Halfling's Halls. Brambletoe Hall has ever been deep, warm and filled with mirth. Within, the good Mayor Willic Brambletoe long presided over tables of warm mutton, fresh apples, berries, peaches and the like, as well as wondrous breads, rich butter and cool drink. Mayor Willic welcomed all, inviting many various and sundry folk to sit and eat with him, or to gather about his great hall and make merry, pass the time and exchange news of distant happenings in exotic lands. But something has changed in that noble Halfling's Halls. A Shadow of Evil has taken up residence there. Not many days past, in those deep hours before the dawn, the sounds of merriment changed to cries of despair. A haunting came to the Goodman's home and left an air filled with the noise of terror and a foul odor of unrepentant evil. Abandoned now, a shadow hangs over the hall. Foul play or murder, none know. But the Shadow of Fear has spread, weirdlings haunt the late hours of the night, stalking the environs of Newbriar. And the locals now say that Newbriar has fallen under the same shadows that darkened Hafling's Halls. In fear, the folk of Newbriar have called for aid, sending riders forth to find courageous heroes willing to rid the town and its population of the terror of the Shadows of the Halfling Hall.